Do you have fabric that you feel is 'too precious to cut into'? Ridiculous, isn't it. It's not doing much good folded on a shelf. The Marimekko fabric that Andy brought back for me from Denmark a year or so ago just had to be used. I'm so very glad I plucked up the courage. 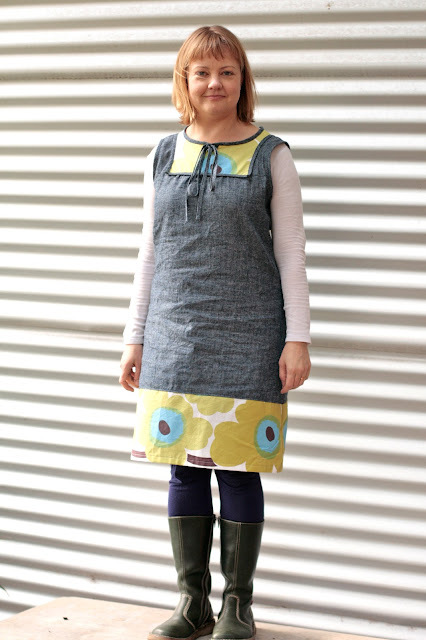 I love this Make it Perfect Poppy Tunic pattern, and I made this one knee-length so it's suitable as a summer dress as well as for winter-over-leggings. I made the same alterations as I did last time (a little shaping on the side seams and taking in at the front shoulder pieces) and cut the bottom panel in a continuation of the slight A-line shape. The main fabric is a hemp/organic cotton denim from Duckcloth. Actually I don't know I'd really call it denim since it's really rather lightweight but quite beautiful and lovely to work with. I haven't put pockets on this one yet. I'm a bit reluctant to spoil the simple look, but... I really love pockets. And I don't know that side seam pockets would do my shape any favours in this. Any suggestions? Love this one Jane - gorgeous fabric choices. I added side seam pockets to mine, and couldn't contemplate it without them. Mine did end up too wide around my hips though. Glad to know you'll be making more! I think this one will be thrashed to death over summer. Thanks :) Yes, I think I agree on the pockets. I will see how long I can survive without them. I love the story about your Marimekko wall art! It's such a classic design, isn't it. I thought the flowers might be too big to work on this dress but I'm really happy with how it turned out. It looks great - such a terrific use for that beautiful fabric! I'd leave pockets off unless they're in the side seams. Enjoy wearing it - a lovely dress! What a great way to showcase the fabric. Just the right composition. Looks fabulous. Thank you! Yes it was tricky to play around with getting the flowers positioned without wasting fabric but then that's part of the fun of sewing, isn't it. It is good to use your precious fabric ( because hopefully it won`t be the last and will encourage your husband to buy more ! ). I haven`t done these before but could you add welt pockets - that wouldn`t change the curves of your tunic - perhaps using some scraps of your Marimekko fabric . Anyway your new tunic is very special and looks great - I love contrasting yokes on clothes as well. Welt pockets - that's an interesting thought. I have never made them before but I'm sure I'll try one day. I will keep them in mind for future projects. I think I'm resigned to this being pocketless in the name of fashion! Looks Fab Jane. Why not make a small bag you could tie loosely around your waist or hang from a belt instead of pockets? After all, isn't that the original pocket? Actually I may just have imagined that. Eeeek! It's gorgeous! (And your hair looks so pretty btw). I love pockets and feel a bit empty-handed (?) without them, but in this case, your tunic looks so perfect I would leave them off. Aww... thanks Emma! (about the hair too... I just cut my own fringe!) 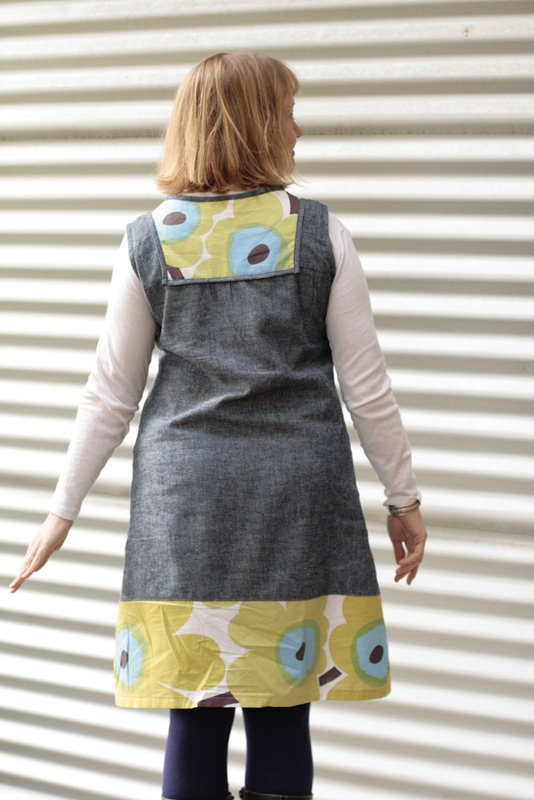 Know what you mean about pockets, if I don't have them I find myself reaching for them still! You did a much better job of cutting your own fringe than I would do. I'm handy with the scissors - but not THAT handy! Well done beautiful you! You look great here! Your hair looks good and you look happy (flushed from hard work cleaning gutters?) in your nice new frock! Lovely dress! I love the fabric. I have several pieces of fabric that are too precious to cut into, and have been sitting in my stash so long I've lost all sense of what they might be good for. Must remedy that! Well done. Hey, I would really love to know what you think. Go on! I'm Jane, and 'H I J K Lempo Bee' is how my youngest son first sang that tricky bit in the middle of the alphabet. I live with my lovely husband and our three growing boys, a cat, a greyhound and six chooks. I'm an ex-advertising copywriter turned co-owner of a fabric shop called The Drapery and I love to sew. Thanks for visiting!